Alison Mannell of Firebird Training Limited in Tunbridge Wells re-launched her Job & Young Entrepreneur Coaching business in January with the help of Ed Craddock & Will Beeching, two 18 year old entrepreneus running a full service creative agency. 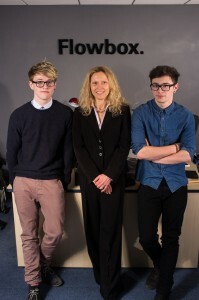 Alison commented “Ed & Will of Flowbox Design in Maidstone needed someone who knew how to handle young entrepreneurs, who understood the business world and who also had the drive and enthusiasm they needed to kick start their business. I needed a complete overhaul of my current youth website. A friend of mine just happened to be Will’s Mum and after having a chat with Ed & Will I knew it was a match made in heaven. Ed said “For the first week or so, we were talking and discussing things multiple times a day. Will added “We started developing Alison’s new website with a completely new design, which she loved straight off the bat. Two months down the line and the new Firebird:Youths website has been launched. Ed continues “In our meetings with Alison we discuss our own business now. This is where, we feel, she really stands out from other mentors. She is determined to keep us on track, to set realistic goals and to have us think about things we hadn’t thought about. Will is excited to say “We now have goals to accomplish within a given time frame. Our next major goal is our official launch of our new offices on Monday 18th February, between 3pm and 7pm. Maidstone, Kent, ME156QS where we are offering visitors a free review of their marketing materials, and a 50% off voucher for our social media course. “I am really excited and proud of what Ed and Will have achieved in such a short time. They have worked really hard to get their office set up, business off the ground and have already worked on some amazing projects.” Alison commented. 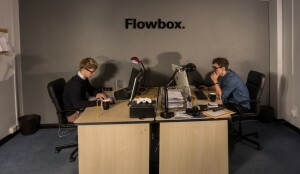 Paul Barron, Director of Kent Foundation for Young Entrepreneurs, commented “Flowbox Design gave us creative solutions to our print design problems and gave us a unique personal service. I met Ed and Will at the Kent Foundation offices last December. Full of flair, enthusiasm and commitment they offered great advice and excellent products. They have some great ideas and a loan from Start Up UK. We initially offered them a couple of small contracts and their response was extremely creative and exciting! I invited them to the KEiBA Launch in January, a great opportunity for young business people to begin their networking and generate new contacts. We are now in regular contact. I would highly recommend them for their fresh approach and insight into print design. Will said “Paul has given us the opportunity of producing leaflets and invitations for The Kent Foundation ABlast event being held at Oakwood House in Maidstone on Tuesday 29th January. We have thoroughly enjoyed working with the Foundation and grateful for the support they have given us. Ed continues “It has also been an incredible experience working with Alison. She has evolved our business and the way we handle clients in the best way possible. She has been able to help us out in so many ways and encouraged us to do things on our own and not have to rely on her to do things for us. We are beginning to grasp the business world and feel like we’re ready to conquer it! Alison responds “Ed and Will are extremely talented individuals. They have embraced my website project and gone the extra mile to achieve what I believe is now a more useful resource for young people, their parents, educational establishments and businesses. I will continue to employ them as my designers and am more than happy to be their business mentor. Please send me great tips on how I can secure my ideal job or set up my own business. We hate spam as much as you do and won't share your details with anyone else. How do you keep motivated to do your studies?